Indoor Aerials, Attic Aerials, Boosters + more all provided by ABC Digital Aerials. We can provide and install a new satellite dish with a new HD LNB. This will enable you to watch HD Television providing you have a High Definition Satellite Receiver. 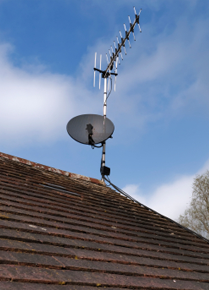 All our satellite dish installations work with all the Sky and Sky+ packages. We can also install a satellite dish to work with your own custom equipment, like the a PC Satellite Card, Dreambox, OpenBox, SkyBox, Amstrad direct into your TV and any other receiver you want to use. *Price includes on site visit, up to 15 meters of cable, F connectors, dish, LNB and brackets. Our satellite dish installation will work with any satellite receiver or TV. Unfortunately we do not supply or provide any satellite receivers, we provide the hardware, like the satellite dish and cabling. We can not help with you with any custom receivers.